Three simple questions to find the right Qantas Money credit card for you. Do you prefer a low annual fee or more benefits? If you are an existing customer, please call us on 1300 992 700 before you apply. but you must earn $35,000 or more per year to apply for a Qantas Money Credit Card. You may be interested in our Qantas Travel Money card which also allows you to earn points on domestic and international spend. Still finding it a hard to choose your Qantas Money credit card? This Credit Card Selector Tool is intended to be a general guide only. The results shown do not take into account all your personal circumstances or needs. This Credit Card Selector Tool is intended to help you compare Qantas Premier credit cards only and there may be aspects of the products that it does not compare. Please visit the Qantas Premier Credit Card Rewards Terms and Conditions before you apply. Earn rate for the Qantas Premier Everyday credit card: 1 Qantas Point per whole AU$1 equivalent on International Spend; 0.75 Qantas Points per whole AU$1 on Domestic Spend up to and including AU$3,000 each Statement Period, 0.4 Qantas Points per whole AU$1 spent above AU$3,000 each Statement Period: plus 1 Additional Qantas Point per whole AU$1 on Qantas Spend. International Spend means any Eligible Transaction made with a merchant who tells us they are located in a country outside Australia. Domestic Spend means any Eligible Transaction made with a merchant who tells us they are located within Australia.Qantas Spend means the following: flights booked directly through qantas.com and Qantas Contact Centres; Qantas flights booked through selected travel agents; Qantas Frequent Flyer and Qantas Club membership, joining and annual fees; Qantas Gift Vouchers, purchases from qantasshop.com.au, qantasstore.com.au and qantasepiqure.com.au. See Qantas Premier Credit Card Rewards Terms and Conditions. An eligible purchase is an Eligible Transaction as defined in Qantas Premier Credit Card Rewards Terms and Conditions. Eligible Transaction means any purchase excluding (but not limited to) Cash Advances, Balance Transfers, Special Promotions, BPAY payments, purchases of foreign currency and travellers cheques, transactions made in operating a business, payments to other Citi accounts, bank fees and charges such as interest and ATM charges, transactions made using Qantas Points and government related transactions. Government related transactions include transactions with government or semi government entities, or relating to services provided by or in connection with government (for example but not limited to transactions made at Australia Post, payments to the Australian Taxation Office, council rates, motor registries, tolls, parking stations and meters, fares on public transport, fines and court related costs). For full definitions, terms and conditions, see Qantas Premier Credit Card Rewards Terms and Conditions. The annual account keeping fee, currently $49, will be billed to your account on card activation for the first year, and on the anniversary of your card approval in subsequent years. An additional cardholder annual fee, currently $25, applies per additional cardholder. These fees are subject to change. Complimentary Travel Insurance is issued by Chubb Insurance Australia Limited (ABN 23 001 642 020, AFSL No. 239687) (Chubb). For Qantas Premier Everyday and Qantas Premier Platinum, Complimentary Travel Insurance is subject to the terms, conditions, excess, limits and exclusions set out in the Qantas Premier Credit Card Complimentary Travel Insurance Terms and Conditions arranged under a master policy of insurance between Chubb and Citigroup Pty Limited ABN: 88 004 325 080 AFSL No: 238098 Australian credit licence 238098 Citigroup Centre 2 Park Street Sydney NSW 2000, the issuer of your card. For Qantas Premier Titanium, Complimentary Travel Insurance is subject to the terms, conditions, excess, limits and exclusions set out in the Qantas Premier Titanium Credit Card Complimentary Insurance Terms arranged under a master policy of insurance between Chubb and Citigroup Pty Limited ABN: 88 004 325 080 AFSL No: 238098 Australian credit licence 238098 Citigroup Centre 2 Park Street Sydney NSW 2000, the issuer of your card. 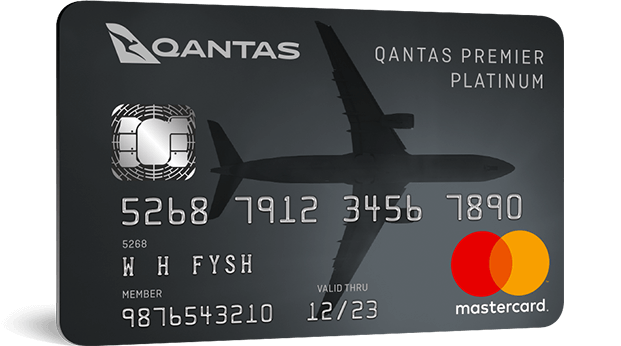 Earn rate for the Qantas Premier Platinum credit card: 1.5 Qantas Point per whole AU$1 equivalent on International Spend; 1.0 Qantas Point per whole AU$1 on Domestic Spend up to and including AU$10,000 each Statement Period, 0.5 Qantas Points per whole AU$1 spent above AU$10,000 each Statement Period: plus 1 Additional Qantas Point per whole AU$1 on Qantas Spend. International Spend means any Eligible Transaction made with a merchant who tells us they are located in a country outside Australia. Domestic Spend means any Eligible Transaction made with a merchant who tells us they are located within Australia. Qantas Spend means the following: flights booked directly through qantas.com and Qantas Contact Centres; Qantas flights booked through selected travel agents; Qantas Frequent Flyer and Qantas Club membership, joining and annual fees; Qantas Gift Vouchers, purchases from qantasshop.com.au, qantasstore.com.au and qantasepiqure.com.au. See Qantas Premier Credit Card Rewards Terms and Conditions. An eligible purchase is an Eligible Transaction as defined in Qantas Premier Credit Card Rewards Terms and Conditions. Eligible Transaction means any purchase excluding (but not limited to) Cash Advances, Balance Transfers, Special Promotions, BPAY payments, purchases of foreign currency and travellers cheques, transactions made in operating a business, payments to other Citi accounts, bank fees and charges such as interest and ATM charges, transactions made using Qantas Points and government related transactions. Government related transactions include transactions with government or semi government entities, or relating to services provided by or in connection with government (for example but not limited to transactions made at Australia Post, payments to the Australian Taxation Office, council rates, motor registries, tolls, parking stations and meters, fares on public transport, fines and court related costs). For full definitions, terms and conditions, see Qantas Premier Credit Card Rewards Terms and Conditions. The standard annual fee, currently $299, will be billed each anniversary from card approval in subsequent years. An additional cardholder annual fee, currently $50, applies per additional cardholder. These fees are subject to change. The Qantas Premier Platinum Primary Cardholder is entitled to 2 single entry complimentary lounge invitations per anniversary year for use at domestic Qantas Club lounges or Qantas operated International Business Lounges (excluding Los Angeles Tom Bradley Terminal International Business Lounge) in accordance with the Qantas Premier Credit Card Airline Benefit Terms and Conditions. Use of the lounge invitations is in accordance with the Qantas Lounge Invitation Terms and Conditions. 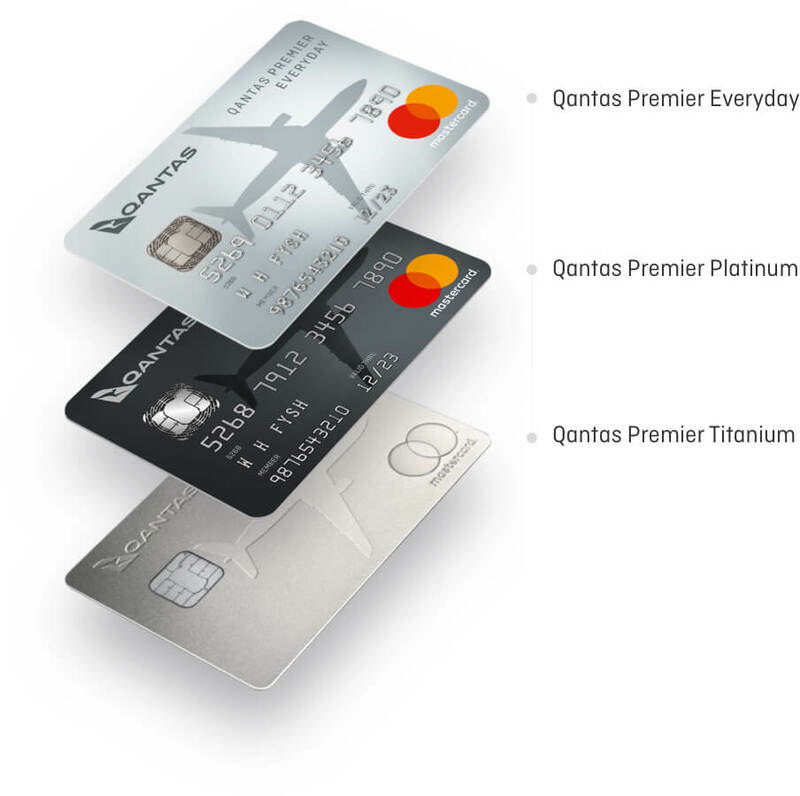 Earn rate for the Qantas Premier Titanium credit card: 2 Qantas Points per whole AU$1 equivalent on International Spend; 1.25 Qantas Points per whole AU$1 on Domestic Spend up to and including AU$12,500 each Statement Period, 0.5 Qantas Points per whole AU$1 spent above AU$12,500 each Statement Period: plus 2 Additional Qantas Points per whole AU$1 on Qantas Spend. International Spend means any Eligible Transaction made with a merchant who tells us they are located in a country outside Australia. Domestic Spend means any Eligible Transaction made with a merchant who tells us they are located within Australia. Qantas Spend means the following: flights booked directly through qantas.com and Qantas Contact Centres; Qantas flights booked through selected travel agents; Qantas Frequent Flyer and Qantas Club membership, joining and annual fees; Qantas Gift Vouchers, purchases from qantasshop.com.au, qantasstore.com.au and qantasepiqure.com.au. See Qantas Premier Credit Card Rewards Terms and Conditions. An eligible purchase is an Eligible Transaction as defined in Qantas Premier Credit Card Rewards Terms and Conditions. Eligible Transaction means any purchase excluding (but not limited to) Cash Advances, Balance Transfers, Special Promotions, BPAY payments, purchases of foreign currency and travellers cheques, transactions made in operating a business, payments to other Citi accounts, bank fees and charges such as interest and ATM charges, transactions made using Qantas Points and government related transactions. Government related transactions include transactions with government or semi government entities, or relating to services provided by or in connection with government (for example but not limited to transactions made at Australia Post, payments to the Australian Taxation Office, council rates, motor registries, tolls, parking stations and meters, fares on public transport, fines and court related costs). For full definitions, terms and conditions, see Qantas Premier Credit Card Rewards Terms and Conditions. The annual account keeping fee, currently $1,200, will be billed to your account on card activation for the first year, and on the anniversary of your card approval in subsequent years. An additional cardholder annual fee, currently $100, applies per additional cardholder. These fees are subject to change. The Bonus Status Credits are awarded to the Qantas Frequent Flyer member who holds a Qantas Premier Titanium credit card and flies on a flight booked with a Qantas Premier Titanium credit card. Bonus Status Credits are only earned on Qantas operated and marketed flights and must be booked using the Qantas Premier Titanium credit card. The offer cannot be used to move you from Platinum to Platinum One Qantas Frequent Flyer membership nor can a Platinum One member use the status credits to retain the Platinum One membership status. Bonus Status Credits will also not contribute to Lifetime Status, Loyalty Bonuses, Platinum Bonus Reward, Platinum One Member additional benefits and will not be earned in conjunction with other Status Credit promotions unless otherwise specified. The Bonus Status Credits offer is subject to change. 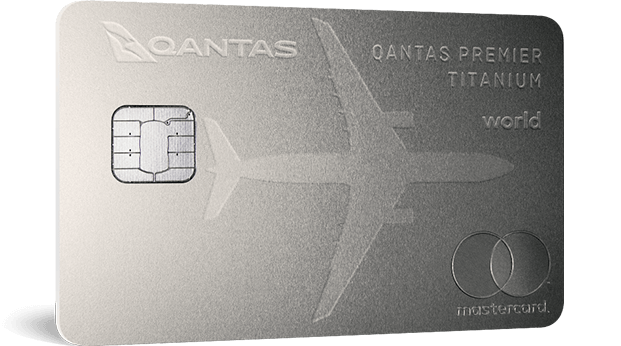 For full terms and conditions see the Qantas Premier Titanium Credit Card Benefit Terms and Conditions. The Qantas Premier Titanium Primary Cardholder is entitled to two complimentary single-entry Lounge Invitations to the Qantas First Lounges in Sydney, Melbourne or Los Angeles and two single-entry complimentary Lounge Invitations for use at domestic Qantas Club lounges or Qantas operated International Business Lounges (excluding Los Angeles Tom Bradley Terminal International Business Lounge) per anniversary year in accordance with the Qantas Premier Titanium Credit Card Benefit Terms and Conditions. Use of the Lounge Invitations is in accordance with the Qantas Lounge Invitation Terms and Conditions. For Qantas lounge locations visit here. 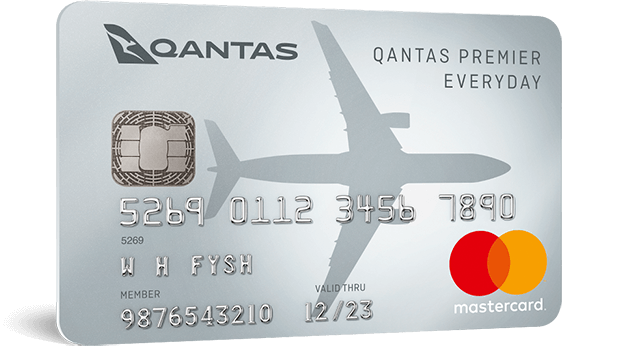 The first Qantas Purchase on your account within 6 months of card approval will automatically convert to a 0% p.a. interest rate for 6 months from the date the transaction is processed. Any unpaid balance at the end of the 6 month period will revert to the variable annual percentage rate for retail purchases, currently 19.99% p.a. A Qantas Purchase under this Special Promotion is any of the following: flights booked directly through qantas.com and Qantas Contact Centres; Qantas flights booked through selected travel agents; Qantas Frequent Flyer and Qantas Club membership, joining and annual fees; Qantas Gift Vouchers; purchases from qantasstore.com.au, and qantasepiqure.com.au For the avoidance of doubt, purchases through qantasshop.com.au are not Qantas Purchases. The maximum interest free period applies when you pay your full closing balance from your last statement of account by the payment due date (excluding any fixed payment option balance which isn’t due for payment by that payment due date and the 0% p.a. for 6 months Qantas Spend Promotion Ending Balance amount). No interest free period is available on cash advances or balance transfers. Whilst you have a balance transfer you will be charged interest on your daily unpaid balance.